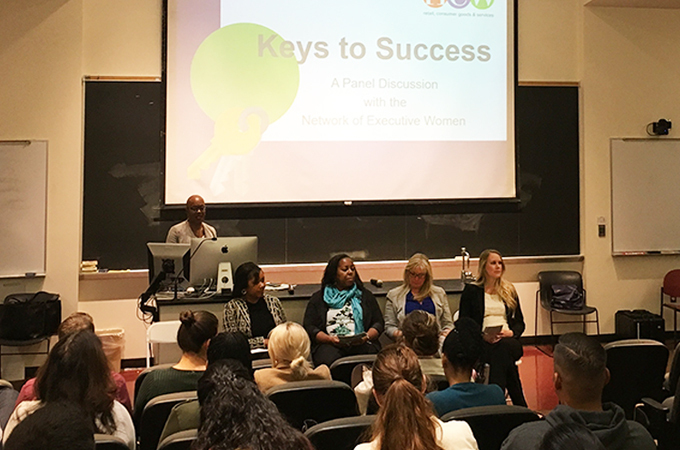 Members of the Network of Executive women (from left to right) Subriana Pierce, Mellonie Celestine, Vicki Sandberg, and Brittany Roussin talk about their personal experiences in the workplace during a panel discussion about women in business. On March 26, the Network of Executive Women partnered with the University of Redlands College of Arts and Sciences Business Administration and Accounting Departments to host a forum titled “Keys to Success: How Women Can Succeed in Business.” The panel was comprised of five women in high powered professional positions who offered advice on seven topics: communication, technology, leadership, teamwork, independence, adaptability, and resilience. Vicki Goizueta, a human resources advisor at Acosta Sales & Marketing, moderated the panel. —Vicki Sandberg, senior risk manager at Mars, Inc.